We were in London Wednesday to Sunday, but the epicenter of the trip was Thursday. 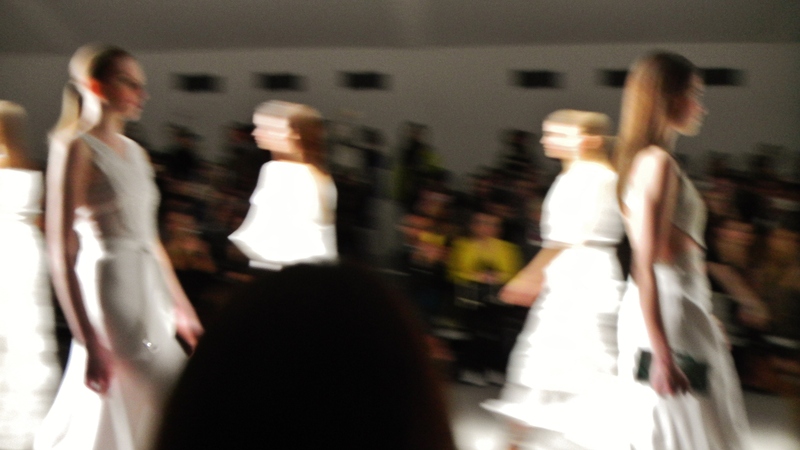 That was the day we had tickets to London Fashion Week festivities and the Amanda Wakeley catwalk. We woke to a chilly, rainy day in London. The sort of day that is perfect for an indoor fashion show, but not perfect for looking your best when you show up at the gates of the show. We primped and twirled in front of the mirrors at our hotel until we felt pretty good about ourselves, but the wind and rain on the streets of London did us no favors. Of all people in the world, the Brits should have a word that means “cute but sodden.” That was us. Luckily, there were no bouncers at the gates of Somerset House with the mission of separating the stylish from the sodden, so we made our way in to the festivities. The courtyard of Somerset House was set with large tents–housing the catwalk shows and a small shopping area. 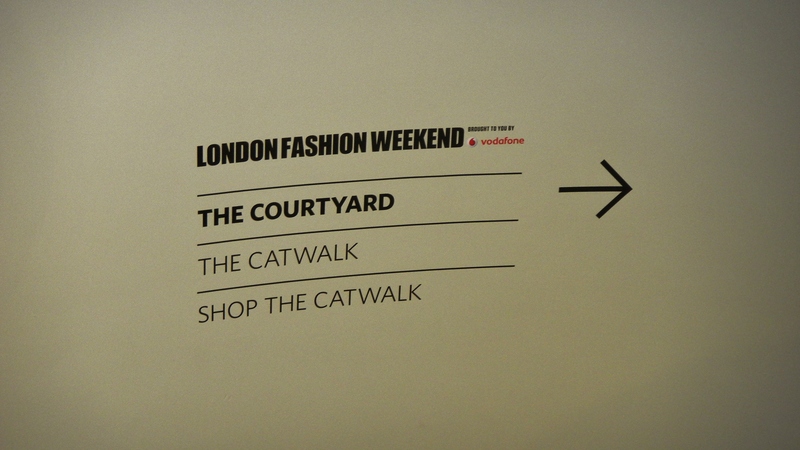 Parts of the interior of Somerset House were set up with other vendors for the “Shop the Catwalk” experience. The spread of bags, accessories, and clothes were impressive (and more egalitarian than you might think: while most shops were very pricey, there were a few offerings in line with every budget). 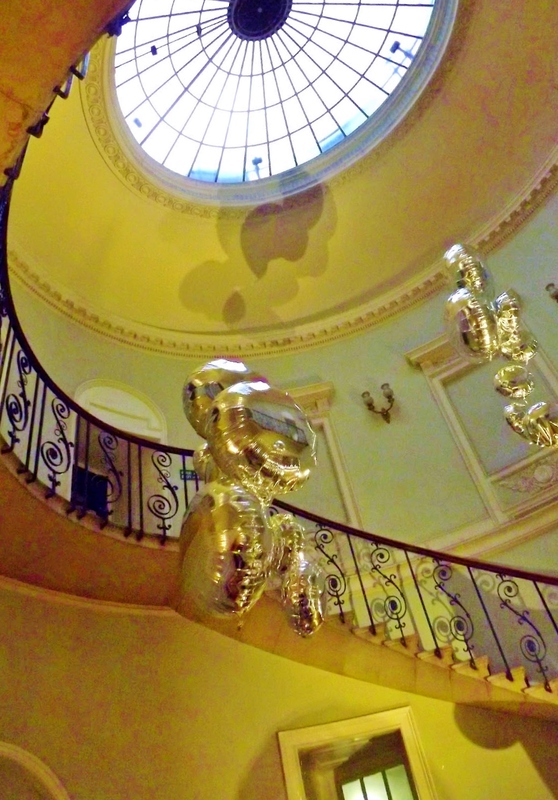 It was quite a spectacle, with the beauty of Somerset House itself, and its grand hallways and staircases, providing an exquisite backdrop. Bourdain’s photography–featured largely in French Vogue in the 70’s and 80’s, and for shoe company Charles Jourdan– was fun, edgy, and occasionally unsettling. Early in his career, Bourdain worked with the artist Man Ray, and the surrealist’s sensibility is always apparent in his photography. 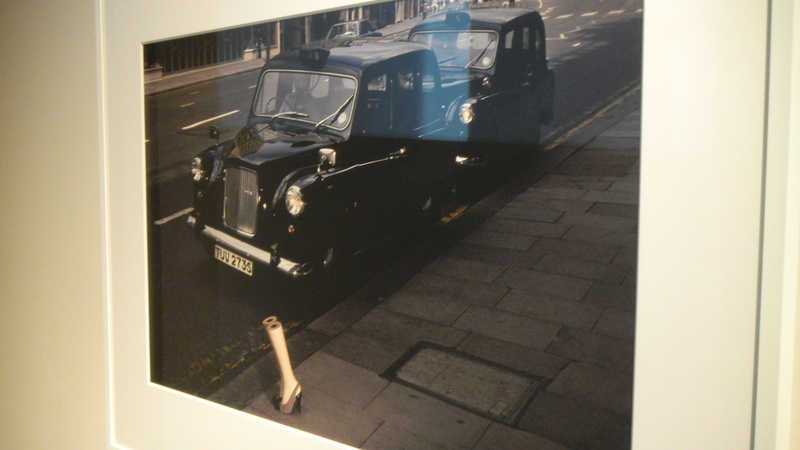 Our favorite series of photographs depicted disembodied legs (calves in exquisite shoes–mannequin’s legs) on the streets of London–hailing cabs or waiting for the Tube, etc. It was a great exhibit, and a fitting show to pair up with the LFW activities. Many of the photos struck a certain tone that I think of as Warholesque– very late 70’s pop-surreal-tongue-in-cheek. All the sass, glamour, and playfulness of high fashion . . . with a little edge, a little menace, the threat of emptiness at the heart of it all. The catwalk show was fabulous and Amanda Wakeley was very gracious when she came out (on crutches) to introduce her collection and discuss her thoughts on fashion. Her philosophy was simple and classic, and that was reflected in the all-white collection she introduced with the catwalk show. We enjoyed the show, but enjoyed our seats even more. That is–we sat on the second row, in good seats, but nothing of note . . . until two minutes before the show started. Then Caroline Rush, the CEO of the British Fashion Council, was escorted to the front row seat directly in front of us. My daughter went nuts. Just the day before, Kate had run down a list of cool celebrities she might see at LFW. The impressive Ms. Rush was on that list. I didn’t know who she was, so Kate Googled her and educated me. Yes, this was definitely Caroline Rush in front of us, cheering on Amanda Wakeley and enthusiastically applauding the show. As the show drew to a close, Katie tapped Ms. Rush on the shoulder and asked if she could take a photo with her. The answer was a very gracious yes, and as I snapped the photo the two of them chatted. They say you should never meet your idols, but if one of those idols is Caroline Rush, then you have no worries, you are in good hands. Wakeley’s catwalk show had been elegant, impressive–but I was partially distracted from the clothes as I kept looking at the models and trying to figure out if this was 30 or 40 different women parading clothing in front of me, or just 15 or so who kept changing outfits. It disturbed me that I couldn’t tell. A few of the women had very distinct faces, but many of them looked so similar, and so blank. They were simply a blur of girls, indistinguishable as individuals. I’m sure that is, in part, by design– they stroll mannequin-esque, with blank stares. They are meant to be blank canvases for the clothes. But an afternoon of people watching and photography exhibits had my mind spinning on bigger questions of who we are and how we present ourselves through fashion–is it about beauty and comfort, is it about innovative art and form, is it about capitalism and consumerism, or is it about the masks we wear, or . . . or . . . is it not reductive? Yes, they are blurry girls. By design, maybe. They could be you. You could be them. 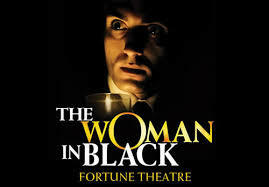 We left Somerset House immediately after the catwalk–we had to turn it around quickly if we wanted to change clothes (and brace for more damp and cold as the sun fell) before we headed out to the West End to catch The Woman in Black at the Fortune Theater. It was a great show–the story was told by only 2 characters, who held the stage powerfully for over two hours. It was a very different experience from the spectacles we usually go to see–Oliver!, Joseph and The Amazing Technicolor Dreamcoat, Les Mis, Mary Poppins–it wasn’t about the stagesets or the carnival, it was a different sort of storytelling, and we loved it. By the time we actually sat down to dinner, in the midst of the blurry nightlife of the West End, it was 11 p.m. We were spent . . . but we were happy. 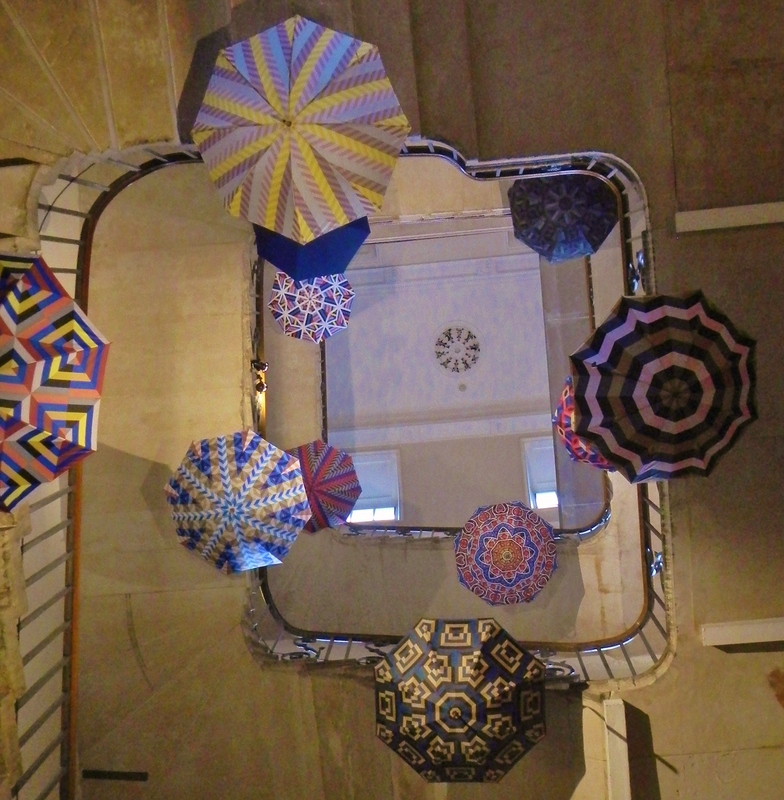 Umbrellas in the spiraling stairs of Somerset House. This is such a great insight into fashion week! I am fascinated by fashion but always feel like maybe I would be out of place attending one of these events. There were all types of people there–fashionistas who were trying to hard; elegant women who looked chic and effortless (I envy them); people like my daughter and me who were well-ish dressed, but nothing special; and some people who looked like they just dropped in during their lunch or gym hour. It was like the Fashion Week after party for the masses, and it was great! You ought to check it out. 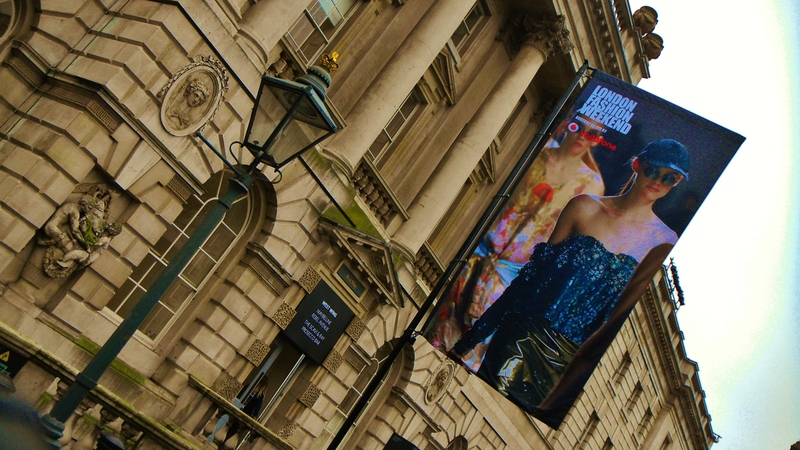 London has two fashion weeks each year–September and February. Thanks. You should attend sometime, it was a blast! We sort of went on a wild hair–my daughter mentioned it, we found crazy cheap airline tix on RyanAir, and Ta Da–off we went. Glad we did; may do it again.